Although the term "ecology" had been invented by the German zoologist Ernst Haeckel in 1866, it was Warming who first adapted the concept to the study of plants. In his earlier years Warming had pursued floristics (including significant studies on locations in the Arctic and Brazil) and plant morphology studies, and by the 1870s had advanced to an evolutionary, adaptation-based point of view that culminated in a well-received monographic study in 1884. 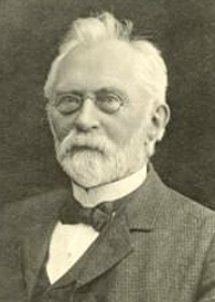 In 1895, however, he revolutionized botanical studies with his book Plantesamfund, translated from the original Danish the next year into German as Lehrbuch der Ökologischen Pflanzengeographie (this eventually found its way into English in 1909 as Oecology of Plants; An Introduction to the Study of Plant-Communities). In this work Warming developed the notion of the plant community, relating this unifying concept to more particular conditions of plant physiognomy and adaptation, and to varying substrates and moisture regimes. Through this book Warming effectively invented the field of plant ecology, also establishing a new foundation for the ecological side of plant geography studies. --born in Mandø, Denmark, on 3 November 1841. --dies at Copenhagen, Denmark, on 2 April 1924. --Dictionary of Scientific Biography, Vol. 14 (1976). --Taxonomic Literature, Vol. 7 (1988). --Botanisk Tidsskrift, Vol. 39 (1927): 1-56. --Nature, Vol. 113 (1924): 683-684. --Journal of the History of Biology, Vol. 19 (1986): 181-196.